It's the shotgun approach to the movies this weekend as no fewer than five new movies hit wide release, along with a couple of high-profile limited release films. There's something for everyone this weekend, though there's no guarantee that something will be good. 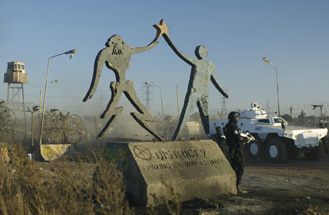 A not-particularly-subtle metaphor for Apartheid and South African racism, District 9 sort of came out of nowhere for the North American public, with a startlingly great trailer, featuring effects that belie its reported $30 million budget. There's a good reason to highlight the director and producer and none of the actors in this production, since virtually all are complete unknowns, unless you're a really dedicated CSI watcher (and I mean really dedicated) or are South African yourself. It's not just an FX reel, though; the film actually seems to have a solid story and something to say.